Heat Maps (or Choropleth Maps) are a thematic maps for geographical representation of statistics. It is a visual way to show how a measurement varies geographically. They can be represented by dots (e.g. longitude and latitude values, or GPS coordinates) or by areas (e.g. countries, administrative divisions, election districts, postcode areas, arbitrary regions, markets, rooms etc.). Heat Map uses a color progression or gradients to depict data per area on the map. 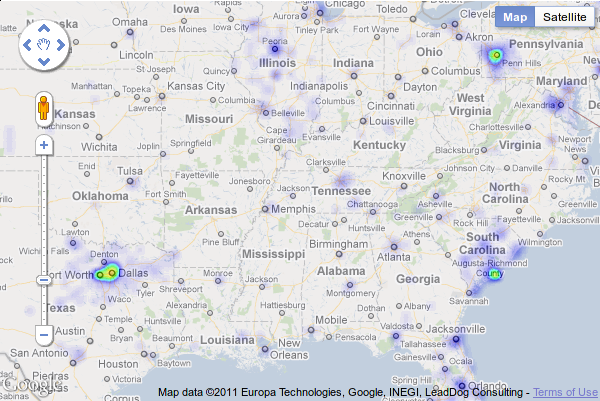 The data source of these heat maps usually come from databases or even Excel files. There are many ways a geographical map can be transformed into a heat map. Simple heat maps can be created by aligning raw data to a color gradient, so that each color in the gradient corresponds to a raw data range. Sometimes, it would be more meaningful to have data analysis and calculations before mapping out the heat map. Complex heat maps can be generated by comparison and manipulation of different datasets. The base map chosen for heat maps can be GIS, online maps or dedicated Flash maps which do not need online access to map data. The heat map pattern can be generated using online scripts, which get data from the database and perform calculations to generate the colors for each area. Then it can be drawn by using API calls for online maps, or generate an XML setting file for dedicated Flash maps to read in and display the colors. Different color progressions, or gradients, can be used to depict different datasets. Here are some examples in which heat maps are useful. If you are interested in doing a heat map and don't know if your requirements suit for one, please feel free to contact us for further consultation.